After a slightly extended absence, Sailor Moon Crystal returns with a new Sailor Senshi in tow, and a whole lot of contrivance as the team investigates a ghostly bridal shop. Moon Prism Power, Re-cap! Act 5 Makoto - Sailor Jupiter - isn't really Sailor Moon Crystal's finest hour (well, 22 minutes but you catch my drift) so far. Whilst it's nice to see this version of the series getting its Sailor team together pretty rapidly, this was perhaps the most disjointed episode we've seen - things don't seem to flow organically and tend to happen 'just because', and what consistency that is there is overtly formulaic way we're introduced to every one of these new Senshi. There is, at least however, a slow (very, very slow, but it's there!) but steady reintroduction of an element that made the original anime so beloved: a sense of humour. The episode opens, naturally, with Usagi being klutzy and Luna reminding her that she should be more aware of her responsibilities as Sailor Moon. And as if to prove the cat's point, Usagi almost gets run over crossing the road, only to be saved by none other than Makoto herself. Once again there's the odd subtle homo-eroticism coming in when Usagi meets these soon-to-be-allies for the first time, this time instead of thanking the girl for saving her life, Usagi's more interested in how nicely she smells and what pretty earrings she's wearing. It's an interesting choice to have Usagi latently attracted to her compatriots, but with it obvious it's not going anywhere thanks to Tuxedo Mask's, it seems like an strange thing to bring up every time it happens. It turns out that Makoto is just the occasional pedestrian-saver, she's a new transfer student at Usagi and Ami's school - and one with a bit of bad rep. As Ami was ostracised for her intelligence, Makoto is a bit of a loner because everyone thinks she's aggressive, with rumours swirling that she was kicked out of her old school for getting in a fight (also that she has superhuman strength - I guess in a world where teenage girls in Sailor Suits are running around at night fighting weird monsters, such a rumour might make more sense, but really school students? All of you think she's got superpowers? Not one one of you stops to think what a dumbass rumour that is? Ah, never mind). Usagi doesn't really care though: the new girl has pretty earrings, therefore SHE MUST BOND WITH HER IMMEDIATELY. It's here where finally, Sailor Moon Crystal starts allowing some humour in, when Usagi engages in a bit of slapstick to enamour herself to Makoto. One of the big hangups a lot of fans of the old Sailor Moon anime had going into this new series was that this would be a bit more of a 'serious' adaptation of Takeuchi's story, and a lot of the more goofy, light-hearted elements of the first anime would be toned down or gone all together. SMC is still nowhere near as humorous as the first (if anything, it feels more sedate than even the original manga) anime, but it's nice to see it at least starting to let itself be funnier. Having bonded with Makoto, Usagi takes her to the local arcade to meet Ami and play the Sailor V game - and of course, like everyone else, she's much better at it than Usagi is, even if her run is cut short by the appearance of Motoki, who's heard a rumour about a local bridal shop from one of his customers. The girls go to check it out (dragging Makoto along for some reason), and things get a little err... weird for a moment. It's hard to reconcile the critical image of Sailor Moon as a force for feminist ideals sometimes when you remember how conservative Naoko Takeuchi's manga could be - and lines like this one stand out. It's not a huge deal in the grand scheme of things, but it brought out a huge contrast between the shows premise (hell, the opening song Moon Pride is all about the girls standing on their own and not needing princes to save them, so having Makoto suddenly be so subservient is jarring). Would it stand out so much without the critical re-appropriation of Sailor Moon we've had for years? Maybe not, and I'm probably reading too much into it but still, it felt like an odd comment. But anyway, the girls overhear that the Bride shop is in fact cursed, a mysterious ghostly mannequin is going around seducing men for nefarious purposes. The girls take this information to resident ghostly expert Rei, and decide to investigate further - and hoo boy, this is where the plot becomes convenience-a-palooza. Ghost Bride just so happens to prey upon poor Motoki of all the people in Tokyo, putting him under some sort of mind control. Possessed Motoki then just so happens to go out searching for Makoto to drain her of her energy as she walks home (wasn't this Youma meant to be seducing men and stealing their energy? Why is it suddenly going after Makoto?) - and when he attacks her, Mamoru just so happens to be walking by. Then instead of actually doing something about it, in true Tuxedo Mask style, he runs off to find Sailor Moon instead. At least we have confirmation now that Mamoru definitely knows that Usagi is Sailor Moon, considering he breaks into her bedroom to come fetch her (NOT CREEPY AT ALL, TUXEDO MASK). Luckily nothing too bad has happened to Makoto in the time it takes Tuxedo Mask and Usagi to get back to her - and he runs off again, instead of, ya know, actually helping. It's a good job then, that Ami, Rei and Luna just so happen to know where Usagi ran off to, joining her literally seconds after Tuxedo Mask scarpers, and after a hasty transformation, the girls are almost immediately complete incapacitated by the Youma and Nephrite. At least Sailor Mars got to let off a pretty kickass fire spell first. After a little lesson from Sailor Moon on the power of true love (it turns out that Makoto left her old school because the Senior student she fancied had a girlfriend. 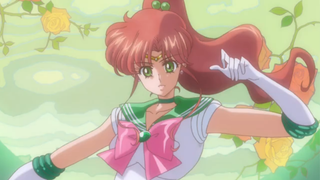 ), Makoto's power as Sailor Jupiter awakens, and she transforms into the Guardian of Strength and Courage! Even though they're all CG transformations, in a way it's kind of a shame that Sailor Moon's transformation was the first one revealed out of necessity - it's not as elaborate or as interesting as the ones for Ami, Rei and now Makoto. Next time though, it seems the Sailor Scouts are going to try and get to the bottom of just who the mysterious Tuxedo Mask is, and whether he's friend or foe in the quest for the legendary Silver Crystal. Who knows, maybe he'll have to do something other than run away for once?